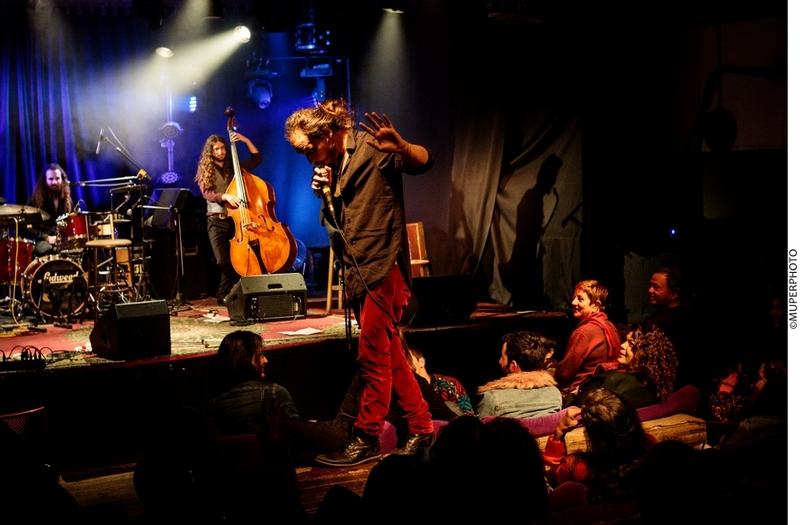 When a rock concert starts with lead singer-songwriter Davidavi Dolev handing out sock puppets to the audience, you know that you’re in for something different…Last night at the Zone in Tel Aviv was utterly uninhibited, dramatic, hilarious, and magnificently wild. Gunned Down Horses (GDH) are a restless band, surging with creative chaos. This winter they are touring with Gunned Down, Stripped Down, Unplugged – an intimate, acoustic show, with new arrangements of their originals and a spine-tingling cover of Einfach Kurt’s Smoking Can Lead to a Slow, Painful Death. 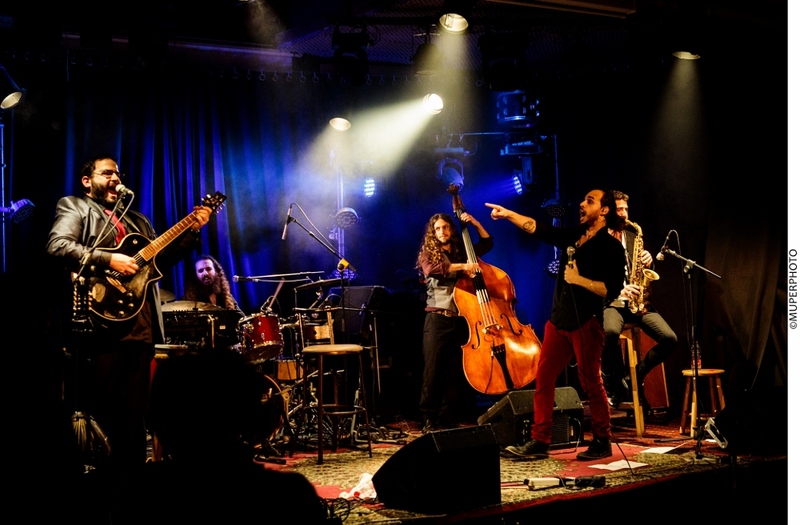 GDH are: Davidavi Dolev – vocals & mayhem; Adam Uriel Burstein – acoustic guitar, bouzouki, harmonica, whistling; Yuval Tamir – drums; Nadav Goldberg swapping out the electric bass for an elegant contrabass; Nimrod Eldar – keyboards; Guy Shoval on saxophone. The stage was set up for an acoustic performance, complete with the traditional tall stool for the lead singer. Opening for GDH and setting a mellow mood was Loren Noyman with a lovely voice and songs that have the feel of green meadows and the open air. 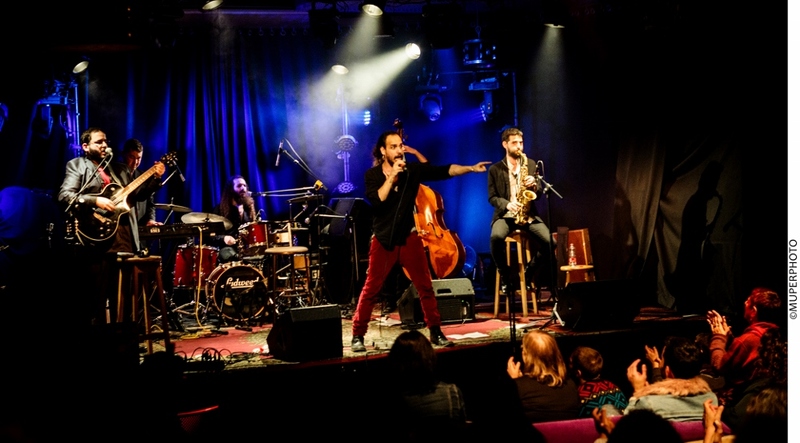 Performing with Loren were Omri Keren and Matan Egozi. But this was no ordinary acoustic show, and Gunned Down Horses delivered an extraordinary performance. Lead singer Vidi Dolev embodies a mad physicality marked by frenetic energy, he has a mesmerizing voice resonant with the darkness of demonic depths, rising to eerie heights, then diving down once more. 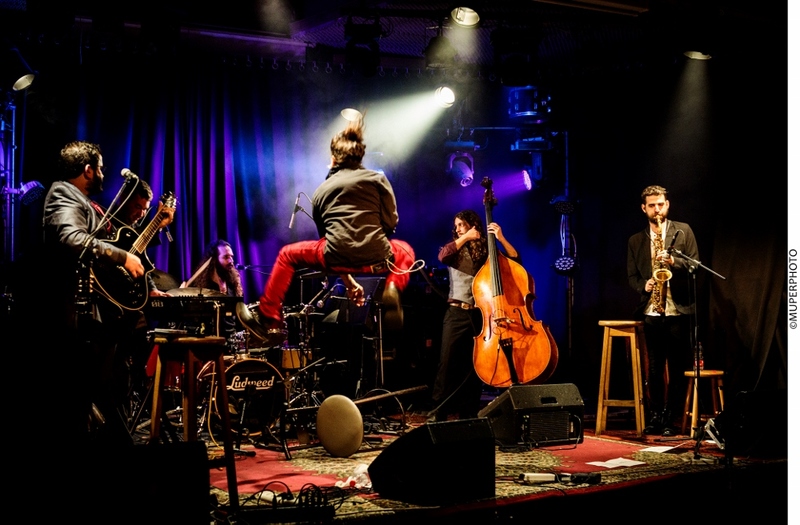 On the perilous terrain of the stage it’s a mixture of brilliance and daring that determines how far you can go, and these musicians transgress and transcend. Seductive, sinister, sincere and sometimes silly, songs with lyrics written in the heart’s blood sprinkled with glittering confetti, and music that dances anywhere and everywhere, shifting genres in a heartbeat. There is something about their elegance and sense of the macabre that always reminds me of Edgar Allan Poe – if Poe wrote music and had a sense of humor. There is a torrent of feeling in the songs – an aching beauty that speaks of love and secret wonder, a carnivalesque evocation of horrors. Hyperactive and interactive the intensity rose throughout the night, with the audience swept away on rushing waves of experience. The mic stand, surprisingly, only fell off the stage twice. Einfach Kurt’s sardonic song Smoking Can Lead to a Slow, Painful Death was performed with the audience singing soulfully along on the chorus, hands adorned with sock puppets waving in the air. Because if you can’t have fun, you’re not really alive. Immediately following, all that wild energy was concentrated into the poignant Turtle Doves, a protest against violence and abuse. GDH closed the show with what I think of as ‘the pirate song’, a lusty, rowdy song that had people up and out of their seats, singing along, while Vidi Dolev was down among the crowd, climbing up and over chairs, then leaping back onstage, where Uri held that long, long, final note, and Yuval threw the drumsticks at him. That’s the kind of night it was. All I want now is more.